As the survival of critically ill patients improves, ICU delirium has become a growing public health issue. Delirium is defined as a rapid change in consciousness (hours to days) characterized by reduced environmental awareness, decreased attention and altered cognition. These clinical features can manifest themselves as memory deficits, disorientation, hallucinations, fluctuating levels of alertness, and motor abnormalities. According to Ely et al as much as 83% of ICU patients on mechanical ventilation develop delirium. This figure is significant as ICU delirium is associated with negative patient and healthcare outcomes. These outcomes include increased time on mechanical ventilation, longer ICU and hospital length of stay,  elevated health care costs, increased cognitive dysfunction and increased risk of death. Delirium can be divided into 3 subtypes: hyperactive, hypoactive, and mixed. The table below matches each subtype with common clinical manifestations. In critically ill patients, mixed delirium is the most common subtype (54.9%). Hypoactive delirium is second (43.5%), followed by a small percentage of patients who display purely hyperactive symptoms (1.6%) . ICU patients aged 65 and older are particularly susceptible to hypoactive delirium. Other risk factors common to the hospital setting include the absence of daylight, lack of visitors, sleep deprivation, immobility, and hospital lines. The pathophysiology of delirium is not well understood. Theories related to its development and progression cite anatomical changes in the brain and neurotransmitter imbalances (ex. abnormal levels of serotonin, decreased acetylcholine, excess dopamine) as possible physiologic mechanisms. Given the unknown pathophysiology, there is no imaging or laboratory tests that can diagnose delirium. As a result, delirium is a diagnosis of exclusion that requires careful clinical testing and observation. The following video demonstrates how to perform the CAM-ICU. In addition to ABCDEF bundle, Brummel et al. advocate identifying and correcting for individualized causal factors of delirium (ex. minimizing unnecessary noise during rest hours to reduce sleep deprivation). Physical therapists have an important role in preventing and managing ICU delirium. Perhaps the most important measure is engaging patients in early mobilization in conjunction with nurses, occupational therapists, and physicians. 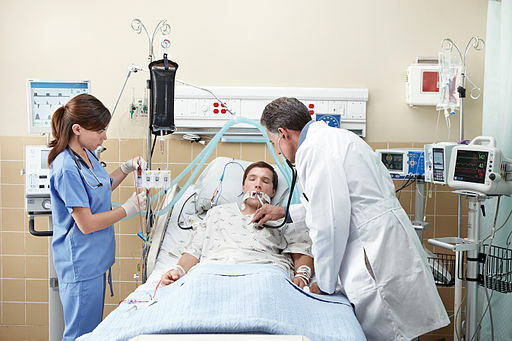 Early mobilization in the ICU has been shown to reduce the number of days on mechanical ventilation, decrease ICU and hospital length of stay and is the only intervention to date proven to decrease the number of days of delirium. Frequent patient orientation, use of a patient's customary vision and hearing aids, and family training and education are additional interventions that can be integrated into therapy sessions. The CAM-ICU is a quick and easy tool for physical therapists to assess and monitor the course of a patient's delirium over time. A systematic review and meta-analysis in 2015 reported that almost a third of patients who are admitted to an intensive care unit develop delirium, and these patients are at increased risk of dying during admission, longer stays in hospital, and cognitive impairment after discharge. For further reading, the ICU Delirium and Cognitive Impairment Study Group is a great resource for learning and staying up to date on best practices for the prevention and management of ICU delirium. ↑ Young J, Murthy L, Westby M, Akunne A, O’Mahony R. Diagnosis, prevention, and management of delirium: summary of NICE guidance. Bmj. 2010 Jul 28;341:c3704. ↑ 13.0 13.1 ICU Delirium and Cognitive Impairment Study Group. For Medical Professionals-- ABCDEF's of prevention and safety. http://www.icudelirium.org/medicalprofessionals.html. Accessed March 8, 2018. ↑ Vasilevskis EE1, Pandharipande PP, Girard TD, Ely EW. A screening, prevention, and restoration model for saving the injured brain in intensive care unit survivors. Crit Care Med 2010;38(10 Suppl):S683-91. ↑ ICU liberation. ABCDEF Bundle. http://www.iculiberation.org/Bundles/Pages/default.aspx. Accessed March 11, 2018. ↑ Salluh JI, Wang H, Schneider EB, Nagaraja N, Yenokyan G, Damluji A, Serafim RB, Stevens RD. Outcome of delirium in critically ill patients: systematic review and meta-analysis. bmj. 2015 Jun 3;350:h2538.